S’treih lhien gra dy dooar nyn garrey Brian Stowell baase Jeheiney 18oo Jerrey Gheuree 2019. V’eh gobbraghey dy creoi son y Ghaelg as son cultoor Vannin, as er-lheh trooid y Chohaglym Celtiagh, as eshyn ny screeudeyr da’n Vanglane Manninagh rish kuse dy vleeantyn. V’eh mie er enn da oltenyn y Chohaglym Celtiagh, as nee eh goll er coayl ayns Mannin hene, feiy ny cheeraghyn Celtiagh as trooid yn theihll. Ta’n erreeish ain ooilley goll magh gys ny paitchyn echey, Kerry, Sean, Caroline as Brigid. Dr Thomas Brian Stowell, RBV, TH who died at the age of 82 on Friday 18th January, was a friend and a mentor in his tireless work on behalf of the Manx Gaelic language and Manx culture in general, including with his performances of traditional songs in Manx, which he recorded in 1973 and were recently re-released on CD by Culture Vannin. Brian was also involved in early documentary films in the Manx language. Brian’s doctorate was in nuclear physics, and after practical work in the field he became a university lecturer. However, he seized the opportunity in 1991 to become the first Manx Language Officer for the Isle of Man Government, developing recognition of educational certificates in Manx for entry to further education and employment. 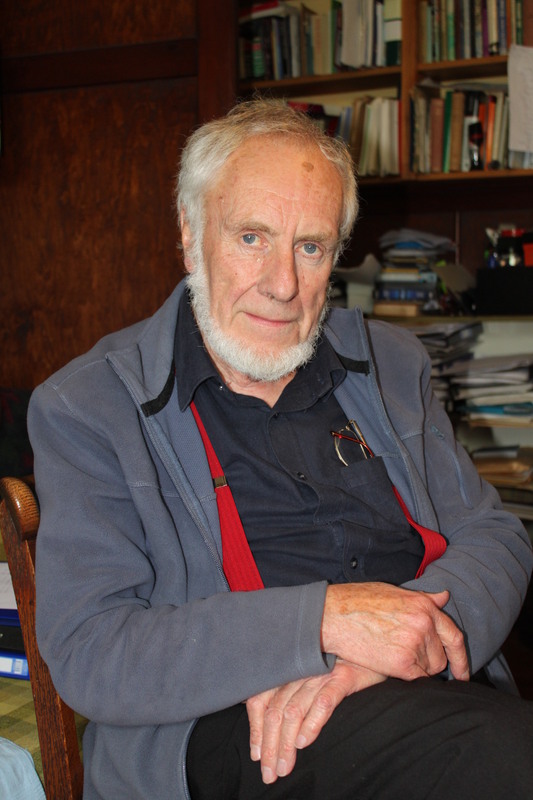 Brian continued to write original material and translate articles and stories of all kinds, as well as preparing Manx courses for use in schools. Amongst his published work are translations of Alice in Wonderland and Manx author Nigel Kneale’s first short-story collection, Tomato Cain. He also published the first Manx language novel, Dunveryssyn yn Tooder Folley (The Vampire Murders). Brian ran adult education classes in Manx, strove for recognition of the Manx language and culture by international bodies, and was the central figure in a 2 hour weekly radio programme, looking at issues of all kinds from a Manx perspective – and, of course, including pieces in the Manx language itself. Brian was also very much involved with the Celtic Congress, which aims not to be political in its approach. However, he recognized that many issues require political solutions, and was also a member of the Celtic League, for which he was a long-time contributor in the Manx language to its quarterly publication, Carn. The inspirational work carried out by Brian without thought of personal kudos or reward was nevertheless recognized in 2008 by the leading cultural award, Reih Bleeaney Vanannan, and by the award for an outstanding contribution to Manx life over a significant period of time and a selfless commitment in doing so, the Tynwald Honour Medal, in 2010. Brian was genial, approachable, generous with his time and his great abilities, full of good humour, witty, learned. He will be much missed by his family and many friends here in the Island, in the Celtic countries and throughout the world.